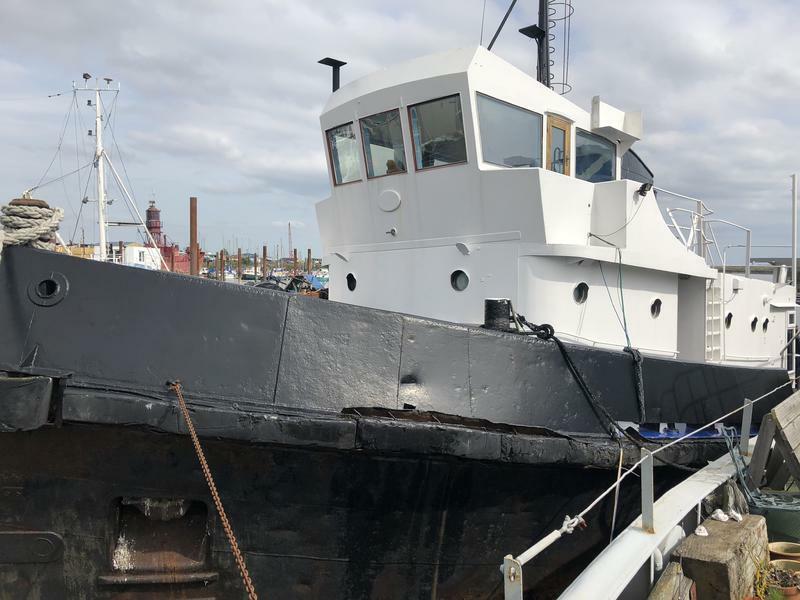 Premier Houseboats are pleased to present Sea Challenge, a tug that has been thoughtfully converted to an extremely high level to create a large and characterful family home. Sea Challenge has undergone a remarkable transformation, the thought and attention to detail has created something very special indeed. Sea Challenge offers excellent space both internally and externally, and offers great living whilst retaining the character of a boat. Spread over three floors, the accommodation is nicely laid out, with access between levels well thought out. Starting at the top, the wheelhouse is a lovely summer/day lounge, offering panoramic views and plenty of light. There is access to the upper deck external area, which offers a great space to sit and enjoy your surroundings in the warmer months. In this area there is a 12' tender with outboard, together with a hoist to lift it in and out of the water. Traditional steps lead from the wheelhouse down to the middle level. This has a large double bedroom, and a utility area. There is also a family bathroom with bath with shower attachment, toilet and hand basin. A corridor leads to the mezzanine area overlooking the open plan living area. This is currently used as an office, but has been created so that conversion to a fourth double bedroom would be easy. This area can be used to access the extensive outside deck area A beautiful staircase leads down to the lower level, which has two further double bedrooms. A corridor leads past the cloakroom that has another toilet and hand basin. Past the cloakroom the lower level opens up into a remarkable open plan living area, an amazing space housing the kitchen , dining area and main lounge. This area is 30' by 22', and fully utilises the large area, and also uses some of the original equipment to create , amongst other things, a log store for the burner. There is a large sky light giving plenty of natural light, and the kitchen has built in appliances as well as lots of storage and work surface. The log burner is the focal point of the room, and with its back boiler forms part of a dual heating system working in tandem with a diesel boiler. Back from this main area is a stairway leading up to the main deck, and also a good sized workshop. The boat has been completely rewired and re plumbed, and fully insulated. The boat has a current survey which can be viewed. Currently moored in Hoo, Rochester, Kent. This is a quiet marina with secure parking and is only 10 minutes walk from the village which has all amenities. The mooring is well placed for people working in Rochester and Chatham or commuting to London. Buses stop at the entrance to the marina and trains to London run from Strood. Nearby is the M2 giving access to the Channel Tunnel and Channel ports. The historic town of Rochester with its Medieval Castle and Cathedral is only 8 miles away and there is a wide choice of pleasant outings to coastal resorts and the countryside in Kent. Schools, Doctors, Post Office and Dentist are nearby and Rochester and Chatham both have excellent shopping centres. There are good local sporting facilities including a swimming pool and golf courses. The marina is set in a beautiful environment with views of the River Medway and Chatham Dockyard as well as the towns of Chatham, Rochester and Gillingham. With a beach, fields and woodland nearby, there are many places to walk and enjoy the area. Sea Challenge offers amazing light and space, great character, and is a superb example of a conversion that creates a delightful family home. Vessel name: Sea Challenge Vessel condition: Good Year constructed: 1968 Year refitted: 2016 Berths: 8 Cabins: 4 Heads: 2 Fuel type: Diesel Length over all: 100' Beam: 25' Maximum draft: 14' Hull material: Steel Hull type: Other Disclaimer Premier Houseboats offers the details of this advert in good faith as it was presented by the seller or his representative but cannot guarantee or warrant the accuracy of this information nor warrant the condition of the described item within this advert. A buyer should instruct his agents, or his surveyors, to investigate such details as the buyer desires validated. The Item described within this advert is offered subject to prior sale, price change, or withdrawal without notice.